Welcome to Ancestral Connections! It is my intention with this site to share the research, knowledge, insights and beauty of my ancestral culture of Trentino, Italy with the hope that it will inspire YOU to learn about the wisdom of your ancestral culture. This endeavor of several decades – to learn who I am by knowing where I come from – has been the most rewarding journey of my life. Along the way, I have met villagers in close relationship with the land, waters, and mountains. As a result of these experiences, I feel a kinship that reaches across the sea to my living relatives and to the land itself, and across time to those who have passed over. It is with gratitude to all my helpers along the way that I offer my stories. My research draws from many ways of knowing and uses a variety of sources, including archeology, folk culture, nature, and oral interviews. Folk stories, once told in nightly gatherings in the mountain villages of the Italian Alps, reveal a legacy of wonder and awe we all can share. Folk wisdom communicates the interconnectedness of all life and responsibility to future generations, offering timely knowledge for living sustainably and in balance. 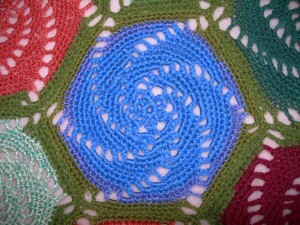 As a symbol of this work, shown at the center of the title above, I have chosen a blue crocheted spiral, part of a hand-made coverlet crafted by my cousin Irma in Valsugana, Trentino. It represents for me the centrality and beauty of women’s work, which sustains life and maintains the cycles of life. 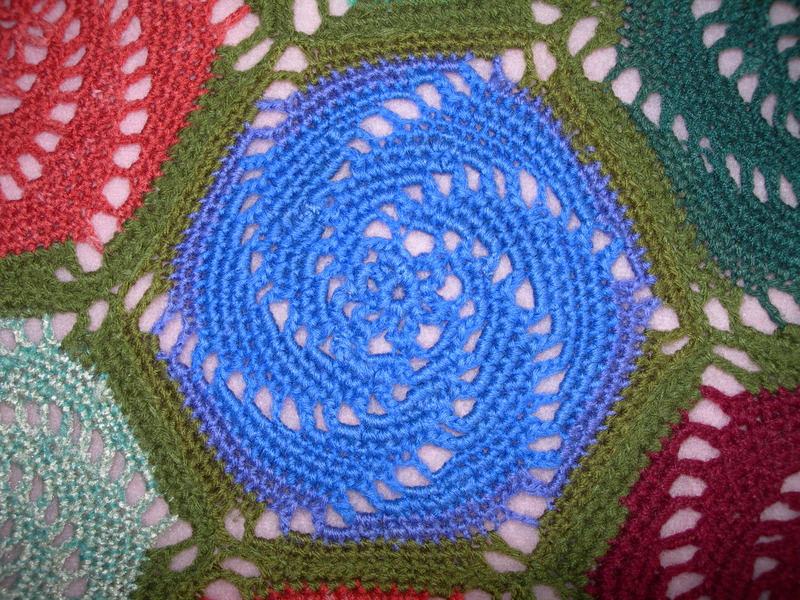 The large crocheted cover comprises several interconnecting spirals of different colors, evoking the connections between nature and the cosmos, between humans and non-humans, and among families across time. Seeded by dreams from childhood, my journey began with the calling of the Ancestors, which you can read about in my first blog entry. Thank you for visiting! May our Ancestors be blessed and honored.